This page will help you if you want to retrieve your Xeoma license registration information, for example, if it was bought by a former employee or if you deleted letter with your license serial number for Xeoma security surveillance. In this article, we will give full instruction on how to restore your license in any case. – in versions before 15.6.26 you can go to Main menu -> Registration -> Information. Here you will find company name and email on which it was registered. – in versions from 15.6.26 you can find information on licenses in use this way Main menu -> Information -> Active licenses. Here you will find last four numbers of your license, email and company name on which it was registered. To get your full license number, please visit our “Get information on licenses registered to this email” page. Enter all the needed information here and you will get full data to the email on which license is registered. If it was your former employee email, please use our “Change registration data for a license” page and change the information. If you don’t know the password to the email on which license is registered, please contact us. We will change it for you and provide all the needed information. If you forgot all the connection data and hadn’t used the license for a long time. 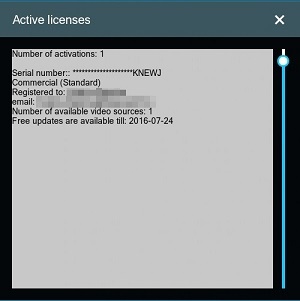 You can restore your video surveillance software license using email on which it was registered. Go to the “Get information on licenses registered to this email” page. Enter all the needed information here and you will get full data on the email on which license is registered. If you don’t remember the email please contact us and try to provide as much information as you can, so we could effectively help. When you have found all the information about your license and now want to re-register it, please use the form “Change registration information” on our website. We hope that this article will help you to find all your licenses!